ABSTRACT: Medical acupuncture was successfully used to treat acute onset hindlimb paresis in a 5-year-old male/intact Pitbull. No definitive diagnosis was made but primary differentials based on radiographs and lab work included fibrocartilaginous embolus (FCE) and traumatic intervertebral disc disease (IVDD). Four sessions of dry needling, electroacupuncture, and class IV therapeutic laser was performed one week apart. The patient was concurrently on Prednisone and Tramadol during acupuncture therapy. At four weeks, the patient was able to walk unassisted with only mild ataxia on non-carpeted surfaces. HISTORY/PRESENTATION: The patient is an 8 y/o male intact Pitbull Terrier named Junior who presented to me for worsening hindlimb paresis and progression from present withdrawal and pain perception to absent deep pain/withdrawal. Acupuncture was the owner’s last resort and discussed that humane euthanasia would be elected if no improvement was seen within one week. One week prior to Junior’s presentation to my service, he was seen at the local emergency room for acute onset of hind limb paresis after playing outside with his housemate. Junior was playing, screamed out in pain, then was paretic; he was non-ambulatory in his hind limbs on presentation. There was minimal pain responses elicited in the thoracolumbar spine. Withdrawal and patellar reflexes were present but weak bilaterally — the left hindlimb was worse than the right. No conscious proprioception was appreciated. Superficial and deep pain was present in both hind limbs. Spinal radiographs showed spondylosis along L7-S2, no masses, fractures, and lytic or productive lesions. No significant findings were seen on routine lab work. The owner declined hospitalization and a neurologic consult. Junior was discharged on Prednisone (10mg every twelve hours) and Tramadol (100mg every eight hours). PHYSICAL EXAMINATION AND CLINICAL ASSESSMENTS: Upon presenting to me, Junior was completely paretic in his hind limbs. He had absent conscious proprioception and no superficial or deep pain present. His left hind limb was weaker than the right. Patellar and femoral reflexes were present but slow. His urinary bladder was full and difficult to express. Lumbar pain was elicited along the thoracolumbar region, specifically between T13-L2. Tight bands were palpated in his quadriceps, triceps, and hamstring muscle groups as well as along his entire spine. After multiple attempts to express his bladder, catheterization was ultimately needed. 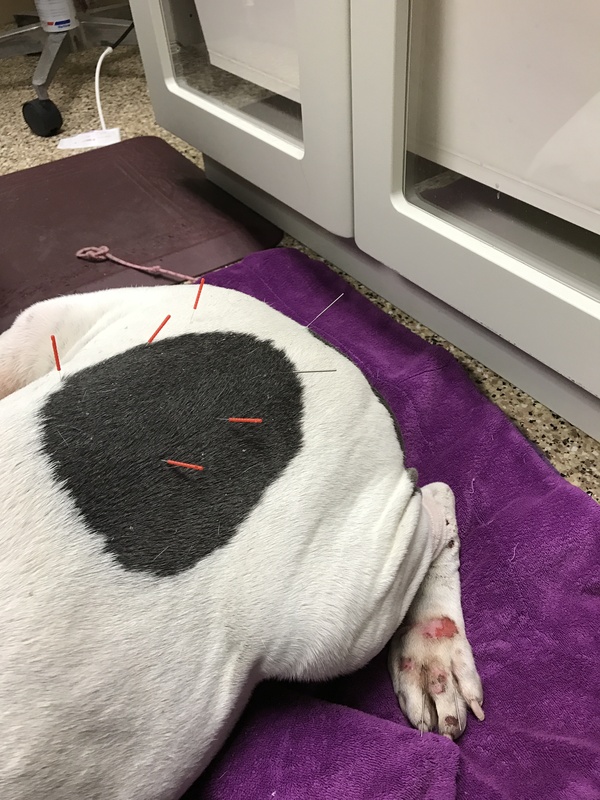 ACUPUNCTURE TREATMENTS: Based on the initial myofacial examination and severity of Junior’s paresis, a combination of dry needling, electroacupuncture and laser therapy was performed at each session. Each session was exactly one week apart. Points used in the first session included: LI4, LI10, LI11, HT3, ST34, ST36, SP6, BL 23, BL 39, BL40, BL52, BL54, BL60, GB29, GB30, GV14, GV20, BaiHui and Bafeng. The main goals of the first treatment was to choose points to stimulate the nervous system, decrease inflammation, stimulate appetite and decrease urine retention. Two days following the initial acupuncture session the owner reported that Junior was able to drag himself, bear brief weight on the right hind limb and urinate and defecate on his own. Points used in the second session included, LU1, SP6, BL10, BL11, BL20, BL21, BL23, BL52, TH14, KI11, GB29,GV3, GV4, GV14, GV20, BaiHui and Bafeng. Both acupuncture and laser were focused on the thoracolumbar spine, left hindlimb and on the sores developed on the plantar aspect of the metatarsal region from dragging. Mild improvement was seen after the second session, which included the ability to bear more weight on the right hind limb. By the third session, Junior was able to bear weight on both hindlimbs and would occasionally knuckle on the left hindlimb on slippery surfaces. Points used on the third session focused on the trigger points palpable in the triceps, biceps and hamstrings. Points used included: LI1, LI4, LI10, LI11, ST34, ST36, SI11, SI12, BL10, BL52, BL54, GB29, GB30, GV3, GV4, GV14, GV20, BaiHui and Bafeng. Twenty-four hours after the third visit, the owner stated that he appeared the most comfortable he has been in 3.5 weeks. On carpeted surfaces he was walking normal with minimal ataxia. On slippery surfaces he was able to walk with occasional knuckling but was strong enough to catch himself before he would slip/fall. The owner was very pleased with his progress and since he was almost back to normal she elected to stop treatments due to the cost of treatment. We offered her one additional treatment free of charge so that we could continue to evaluate Junior’s progress. By the fourth visit, Junior was comfortable overall and very eager for his acupuncture treats. The last session was focused on trigger points, which were significantly improved from his initial treatments. Points used included LI1, LI4, LI10, LI11, ST34, ST36, SI11, SI12, BL10, BL52, BL54, GB29, GB30, GV3, GV4, GV14, GV20, BaiHui and Bafeng. Forty eight hours after the last treatment Junior was essentially back to his normal self and the owner was ecstatic. Based on the progress that was seen after each visit, acupuncture/laser is suspected to have played a critical role in Junior’s pain management and immune system stimulation to help speed up recovery. Financial constraints were the biggest roadblocks to discovering the full potential acupuncture might have had for this patient. Additionally, it was very difficult to keep the Class IV laser glasses on Junior. He appeared comfortable during acupuncture but was very stressed during laser. We attempted to use all types of treats during treatments and this was a significant help in allowing him to settle. Overall, Junior’s outcome was favorable, however, one might wonder if we could have decreased healing time if acupuncture was utilized twice-weekly verses weekly. Therefore, further research on regularity of treatments relating to FCE/IVDD would be beneficial. Janssens L., Rogers P., Schoen A.: Acupuncture Analgesia: A Review. The Veterinary Record 122, 355-358, 1988.